Which Airline Program to Credit your Miles to on a Paid Ticket? Some travelers are loyal to 1 airline, but you can’t always fly the same airline for every flight due to your destination or flight time. I’d much rather fly a foreign airline while traveling internationally to almost guarantee better service than a US airline. When flying for a business trip, sometimes employers want you to book the cheapest flight. You end up with miles in so many different programs and you never use them. Most travelers don’t know airlines have partner airlines which you can earn and redeem miles. I discovered this website called Where to Credit, which shows you how many miles you’ll earn based on the airline and booking class you booked. 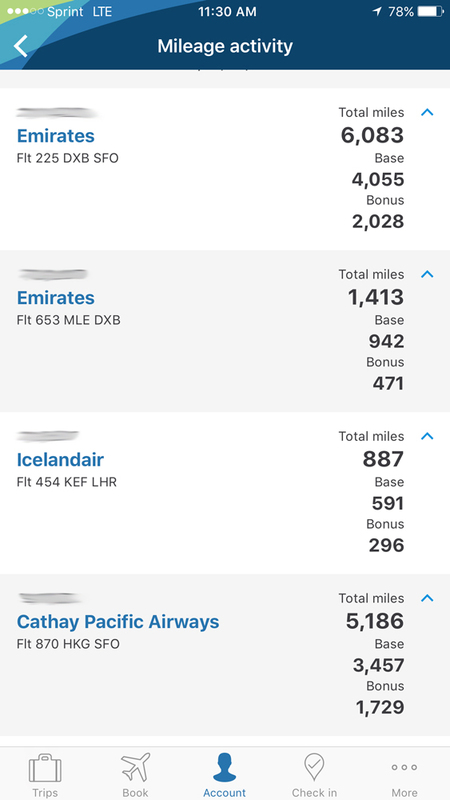 I tested it out on some recent flights and I now have many more miles in my Alaska Airlines account rather than 3 different airline programs (Emirates, Icelandair, Cathay Pacific) as I credited the flights to my Alaska Mileage Plan account. Look at your paid ticket details and find the booking class which is a letter. American Airlines shows it in parentheses next to the class of service [ex. Economy (S)]. Visit www.wheretocredit.com and find out which programs offer you the most miles for your ticket. You’ll also need to factor in how valuable the miles will be for you as well as which programs you have elite status which grant you additional miles. Fly and earn your miles! Flying Cathay Pacific in E Class (Premium Economy) and crediting the miles to my American Executive Platinum account due to the incremental bonus due to my elite status compared to Alaska Airlines which I only have Tier 1 (MVP status). Flying Cathay Pacific in V Class (Economy) and crediting the miles to my Alaska MVP account as American Airlines would’ve given me 0 (yes, zero) miles. Where do you credit your miles? Comment below. If Alaska Airlines offers a great earning value, I’d highly recommend using their Mileage Plan program for any US-based traveler. Their partner redemptions offer some excellent values such as First Class on Cathay Pacific, Japan Airlines or Qantas. Check out AwardHacker on how to spend your miles. Previous story Delayed or Lost Luggage?